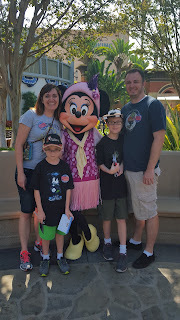 This is the third installment of our Disney vacation. In my first post I talked about planning and prepping for the trip, all the logistics of things. 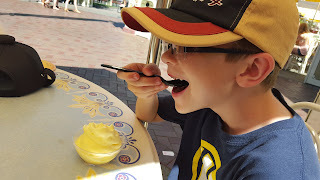 The second installment was all about eating in the park, this one is on all the rest of our meals during our trip. Our vacation started on a Saturday with us driving down to my sister's in Southern Utah, then driving the rest of the way to California the next day. And it ended much the same way, driving back to my sister's the following Saturday, then home the next day. So, 8 days of meals. On our way down to our sister's we went with our trustworthy regular: Chick-fil-a. We got two 8 piece grilled nugget combo meals, that we split among the 3 of us that are gluten-free. It works out nicely, and is a lot cheaper than getting the kids their own kid's meal. With my husband's meal and an extra drink and medium fry tossed in our bill was $25.02. My sister fed us dinner and breakfast both nights that we spent there. Which saved us money and was a lot of fun. Sunday, on our way to California we stopped at an In-N-Out in Las Vegas. We each got a hamburger protein style in a combo. The boys used hamburger buns that I had packed to have regular burgers, I had mine as it came: lettuce wrapped. We also stopped by this same In-N-Out on our way back. 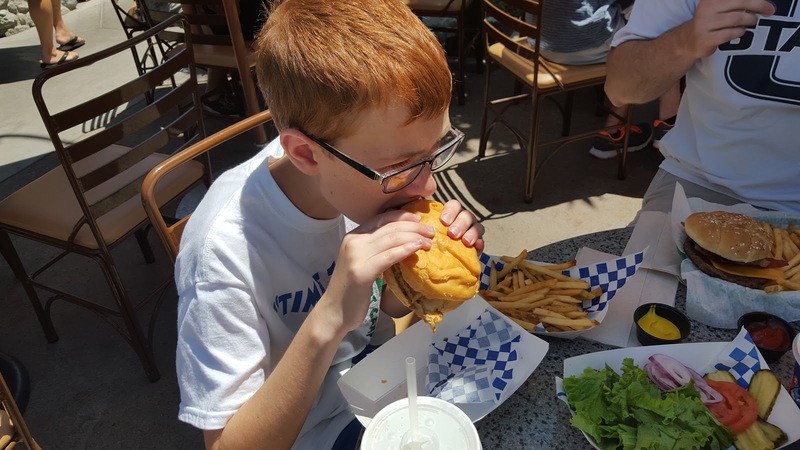 That time, the boys weren't that hungry and just had fries (I know not the healthiest, but hey, we were on vacation), while I had the same hamburger protein style. I love In-N-Out for the fact that they are inexpensive. Our bill for 4 combo meals was $24.43, when the boys didn't want burgers on the way back our bill was $19.67. Sunday, once we reached our hotel, we walked over to Red Robin and enjoyed dinner there. I love their gluten free buns (they make their own now, they don't use the Udi's buns). I had the guacamole bacon burger. 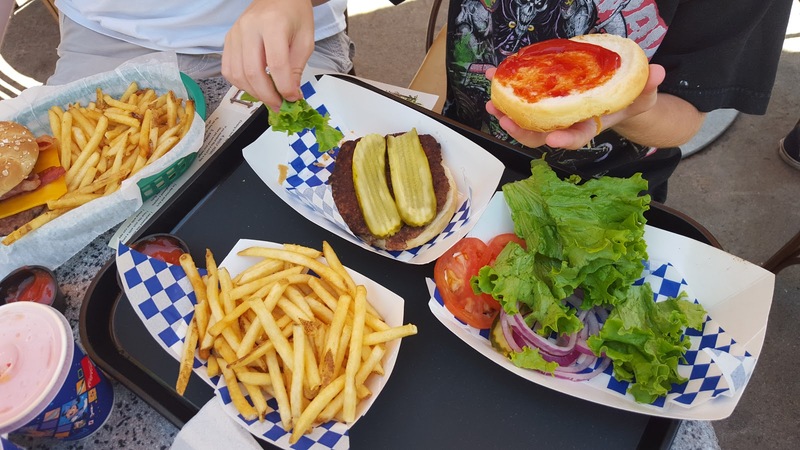 And my boys split the Keep It Simple burger (the toppings come on the side, so they could put on what they wanted). It's cheaper than two kid's meals to do this and the kids burgers aren't all that great compared to the regular ones. I made the quick realization that restaurants are cheaper in Utah. :P But even with California prices dinner came within our budget: $51.63 (including tip). Each morning we were in California we took advantage of the free breakfast at the hotel. It was supposed to be a plated breakfast, but it ended up being a breakfast buffet. They did always have scrambled eggs, hard boiled eggs, bacon, sausage, fruit, and juice. So, it worked out fine for us. I also had muffins for the boys if they wanted those instead, or in addition to the breakfast there. Monday evening we were so exhausted from adventuring we ending up just eating sandwiches in our hotel room. I loved that I had this option for us, it was nice to just stay in that night and not spend money, either. Tuesday night we walked over to the Outback Steakhouse by our hotel. This was the first time I had been to an Outback and to be honest, I was kind of disappointed in the portion of food I got for the price. And this is where my husband got sick, so not the best experience. Anyway, I had the fire-grilled salmon with mixed veggies. My older son had a kid's meal with a lettuce wrapped burger and a baked potato with butter and cheese (he can handle dairy). My younger son didn't want anything there and ate a peanut butter sandwich when we got back to our hotel room. Outback is a bit more pricey, so dinner ran us $66.11 (including tip)...and sadly wasn't worth it, my hubby was sick that night and most of the next day. Wednesday night we went to Coco's Bakery across the street from our hotel. I had the Tuna Salad, which was quite large. It had a scoop of tuna salad on top a huge leafy green salad that was dressed with a balsamic vinaigrette. The green salad and the vinaigrette were really good. The tuna was decent, but there was a lot of it, and I didn't come close to eating it all. The boys split an order of gluten-free pancakes (there were 5 good sized pancakes), I tried one of them and they were really good...they almost tasted like vanilla cake in a pancake form. The boys absolutely loved them and devoured them all. My little one also got a side of scrambled eggs and my older one got a side of hashbrowns. Coco's was more in our price range and our bill came to $47.17 (including tip). Thursday night, we called it in early and ate sandwiches in the hotel room again. Then Friday night we ventured out to the beach and stopped at zpizza in Newport Beach. We ordered way too much pizza, but they had some really good selections and we all wanted something different. 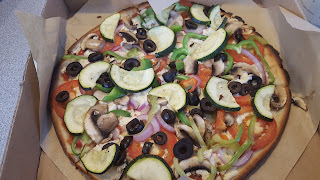 I got their California Veggie Pizza with Daiya Cheese...it was fantastic and I ate the whole 10" pizza (which was probably not the best idea, but it was really good). My older son got his standby of pepperoni, and my younger son got his standby of Daiya cheese. With the splurge of everyone getting their own pizza the bill came to $48.62. By Saturday we were heading home and as I said earlier we stopped at In-n-Out in Vegas before going to my sister's. We had dinner and breakfast at her house before heading the rest of the way home. We did stop and ate peanut butter sandwiches at a rest stop that day for lunch. Budget wise for our whole trip we planned on spending $750 on food...crazy sounding I know, but save for it and budget it in and then you won't have worries. We ended up under $700, even with including snack and drink stops at gas stations along the way. This post was shared on Waste Not Want Not Wednesdays and Allergy Free Wednesdays. Like I said in the previous post, we planned to spend ~$50 a meal for the 4 of us each time we ate out. We knew there would be times it would be more expensive then that, but we tried to stay to restaurants that kept us close to that budget. Few pointers (that I couldn't convince my hubby of, but maybe you'll listen better) stick with water. Soda costs $3-4 at least there, times that by 4, you are spending an extra $12-$16 a meal on drinks. (I have no idea was alcohol costs there, because I don't drink, but really stick with water, your body needs it to stay hydrated). By asking for a cup of water (which they will do gladly for you instead of the bottled water) you will save hundreds of dollars over the course of your stay. Disneyland takes care of you. Tell your cashier at the fast service or server at the full service restaurants that you have allergies and they will have a chef come out and tell you what they can do for you and totally take care of you. Also, FYI, I'm not relaying what my hubby ate, because he doesn't eat gluten-free and I figured it wouldn't pertain to you. Also, you'll notice that we never ate breakfast, or for that matter dinner in the park. 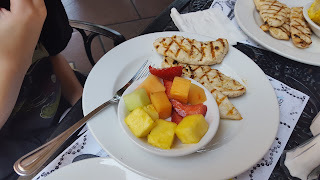 I'll go over that more in my next post, but simply put, we had free breakfast at the hotel and the boys were tired before dinner time so we were back at our hotel by then and just ate at close by restaurants. 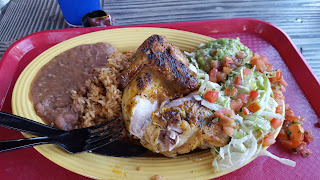 Our first day we ate at Cocina Cucamonga Mexican Grill in California Adventure for lunch. I got the Fire-Grilled Citrus Chicken minus the tortillas. My oldest got a soft chicken taco with a corn tortilla in a kids meal with applesauce and rice. My youngest got a side of rice and beans (he isn't much of a fan of Mexican food and this is what I could convince him to eat). He ended up eating the drumstick on my chicken, too. 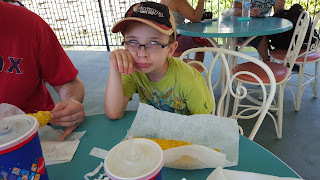 My older son, didn't really care for his taco (he prefers beef tacos) and ate some of my chicken, as well. I loved my whole meal, it was delicious. But for the kids, it was mixed, mainly because of their own personal food likes. Our meal altogether came to $46.80 (with 3 sodas included). That afternoon we also grabbed a frozen lemonade from a lemonade stand across from the Corn Dog Castle. They were delicious and refreshing on a hot July afternoon. For 4 lemonades our bill came to $19.00. 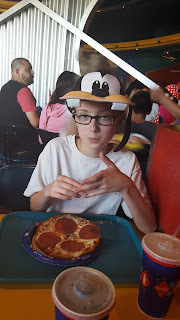 Our second day we ate at Red Rockett's Pizza Port in Disneyland for lunch. 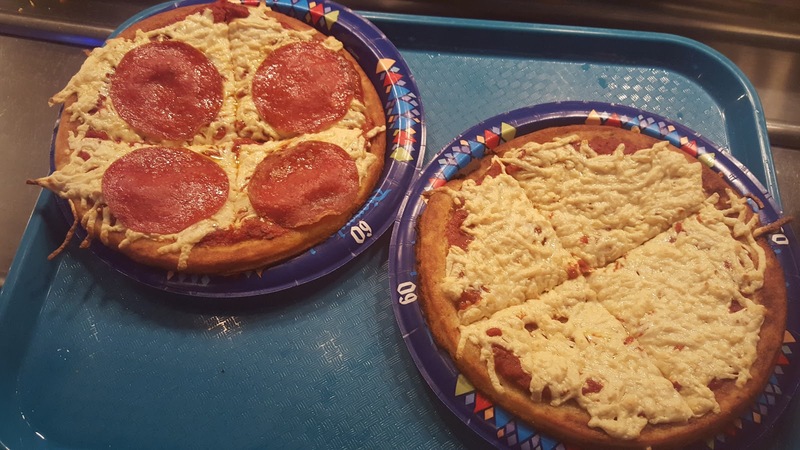 They have individual sized Gluten-free pizza and they have Daiya cheese! (I didn't know about the Daiya cheese part prior to going, so we were quite excited). I think this was probably our most successful lunch at Disney, mainly because everyone in our family loves Pizza. I got the GF pizza with Daiya cheese and pepperoni, my oldest got his with pepperoni and regular mozzarella (he can handle dairy) and my youngest got a cheese pizza with the Daiya cheese. The crust has herbs baked into it and was quite a yummy crust and we stuffed ourselves silly with the food. It was delicious and very much appreciated. The really nice part, the GF pizza was only $8 each, my hubby's meal was by far the most expensive, because he wanted pizza and pasta and breadsticks (it adds up). Our meal all together came to $64.26. 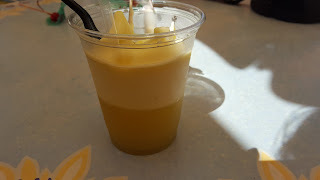 That afternoon we also got Dole Whips and Floats at the Tiki Juice Bar. 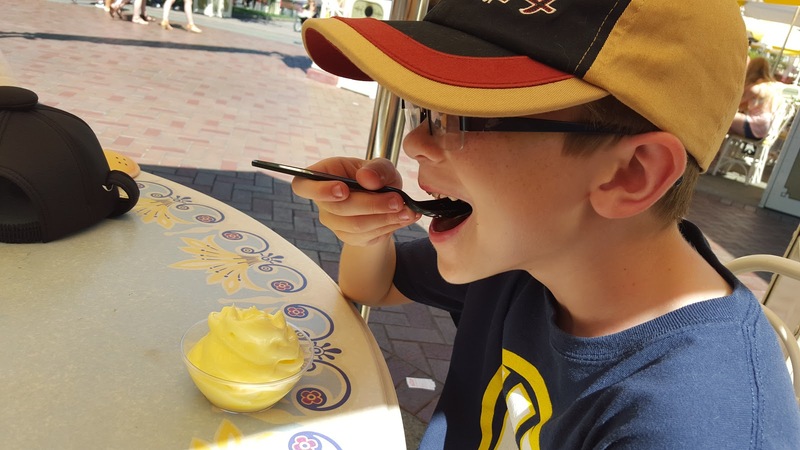 Seriously, if you are going to be in a Disney park you need to get a Dole whip at least one of the days. They are dairy-free and amazing! My hubby and I did the floats and the boys had the whips. The floats are essentially the dole whip with pineapple juice added and they were nice and refreshing on a hot afternoon. Just know that there will be a line, this is a popular stop and it will take a bit of time to get your whips. I sent my hubby and kids off for a bathroom break and window shopping while I stood in line and it worked out great. For 2 whips and 2 floats our bill came to $20.48. 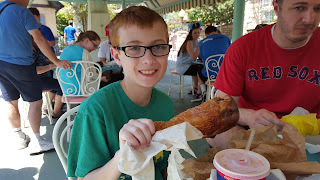 The third day of our adventure we went to Edelweiss Snacks in Disneyland and grabbed 2 turkey legs and 2 corn-on-the-cobs (please note that they come already buttered...my little one can handle butter, so we went with it). The turkey legs are huge and will feed at least two people. My hubby wasn't feeling well, so we probably could have gotten away with getting only one turkey leg, but hind sight is better than foresight. Turkey legs are $10 each, so share to make it worth the money. I loved the turkey legs and so did my youngest, but my older son and my hubby weren't the biggest fans (my son because he's not a big meat eater, and my hubby because he wasn't feeling well). With sodas added in our bill came to $46.25. 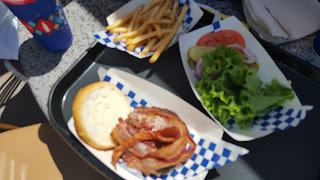 On the fourth day of our adventure we were back over to California Adventure and stopped at Smokejumpers Grill--seriously amazing burgers, with seriously amazing buns. We tried to eat before the lunch rush each day, but we hit it that day, and it took a little while for the chef to come out and take our order. But he took care of us. I got a bacon burger (no cheese), my older son got a grilled chicken sandwich (no cheese, no sauce), and my younger son got a kid's hamburger (the chef made him a full size burger, because it fit the bun better, but didn't charge us any extra). We all got fries, which are made in a separate fryer, and they gave us fresh toppings to use from the kitchen, so we wouldn't have to use the condiment bar. The kids really could've share one meal, the sandwiches were huge and they both only got through half of their's...lesson learned again. But it really was a fantastic lunch. The bill came to $52.20. 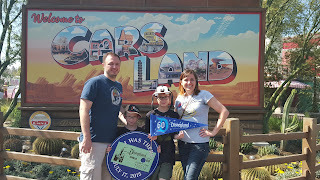 The last day of our Disney adventure also happened to coincide with the actual 60th anniversary of Disneyland. Talk about holy crazy day with massive crowds! 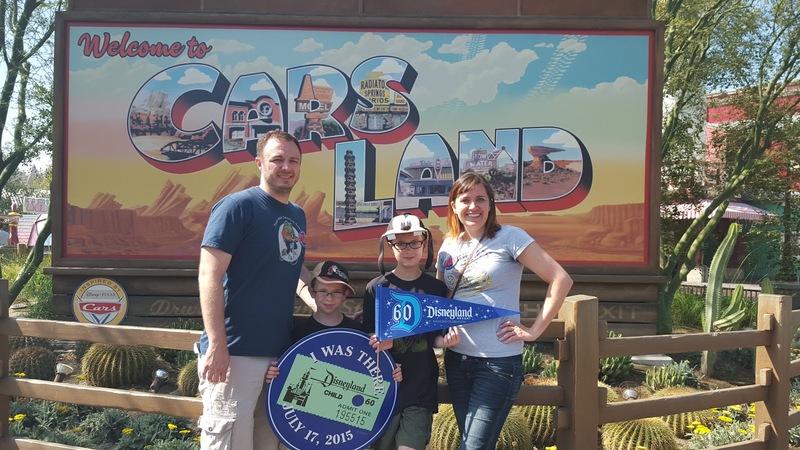 We rode a few of our favorite rides, and then decided it was just too crazy in the Parks and went over to Downtown Disney to look at the shops there and ate lunch there as well. This was the only time we chose a sit down restaurant. We sandwiches at the hotel a few times for dinner, which made this lunch doable for us budget wise. 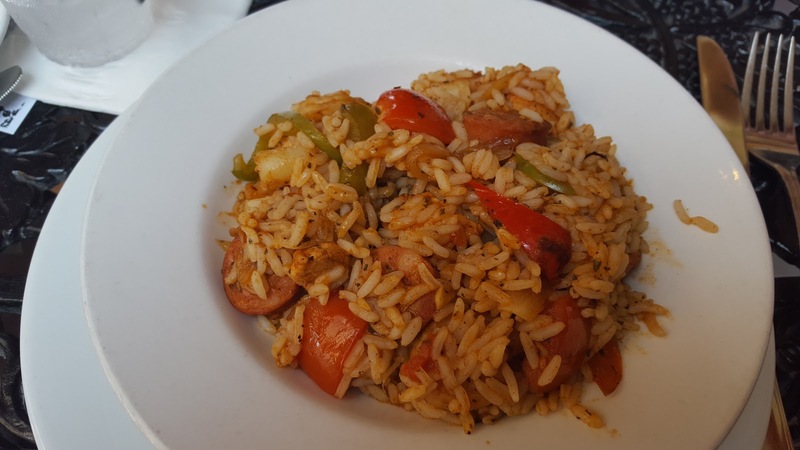 We went to Ralph Brennan's Jazz Kitchen, because I heard that the Jambalaya was amazing and really wanted to try it. And yes, the Jambalaya is amazing. The server was really good to answer all our questions about the food and to double check everything we ordered. 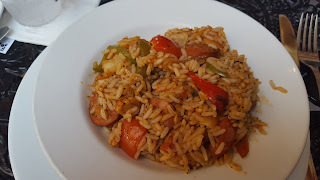 I ordered the Jambalaya without butter, subbed with rice (it's normally a pasta jambalaya). 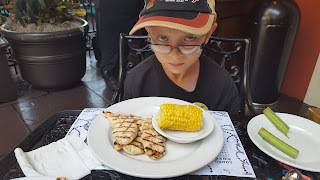 My boys each got a grilled chicken strips kid's meal. My older son had his with fruit, my younger had his with corn on the cob. If I had known how much chicken they would get I would've had them split the meal. It was three huge tenders, that would equate to at least a breast and a half of chicken. They ate what they could but it was just too much food. The corn on the cob was gross, based on what my son said, but they split the fruit and it was enough for both of them. They also got carrots and celery as an appetizer before their chicken came out, so yeah, it was a lot of food. Since this was a sit down restaurant, the bill was a bit higher. My hubby also got himself an appetizer in addition to his entree and we all got sodas...which made this a hefty bill of $79.55 (including the tip) when all was said and done. Overall, Disney does take care of you. They are trained to take care of you and they have options for you. This vacation was seriously the best in terms of finding places to eat and having excellent food to eat. 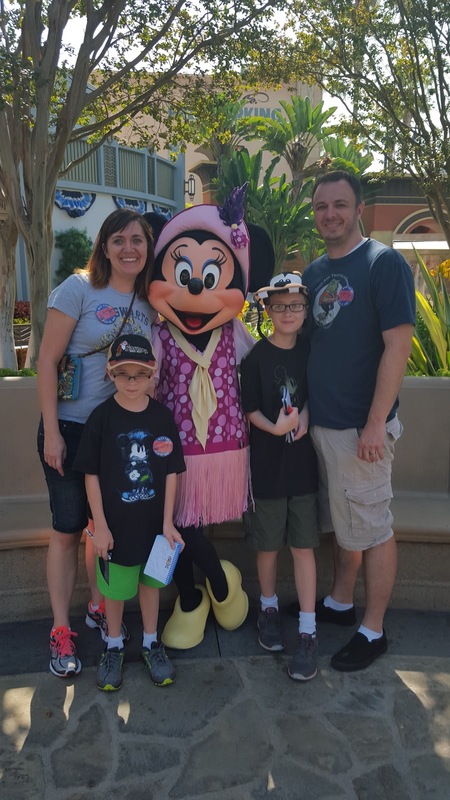 We just got back from spending a week at the happiest place on Earth! And it really is the happiest place, none of us were ready to come back to reality. I wanted to share with you our experience, and not just our food experience, but everything, so if you ever go to Disneyland you have a few tips to help you on your way. This post will be about the prepping and planning of the trip. We used Get Away Today to book our hotel and tickets. I did shop around a bit and they really do offer the best package deal and they are a local company for us, so I'm all about supporting local companies when I can! 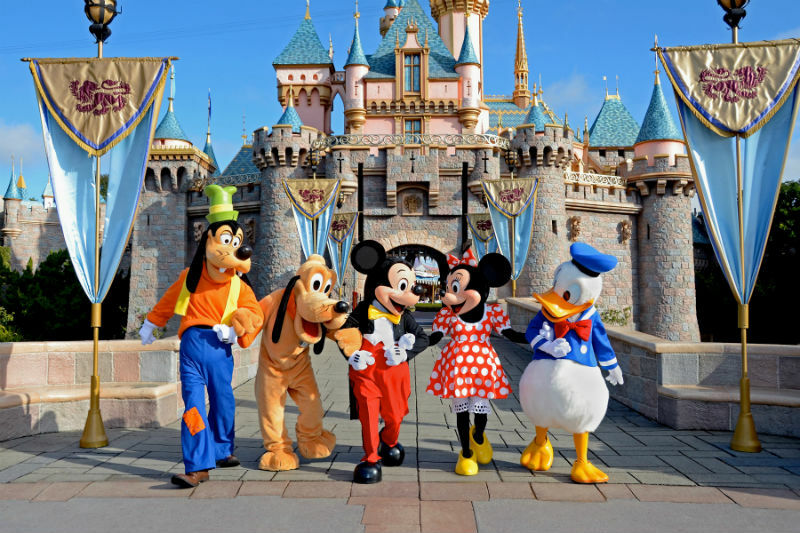 My criteria for choosing a hotel was 1) free fridge in room, microwave would be a bonus, 2) free breakfast that we would be able to eat, 3) free shuttle service to Disneyland, 4) free parking for our car, no extra resort fees, etc., 5) a pool. We ended up going with the Wyndham Anaheim Garden Grove Hotel. It had everything on our list (except the microwave) and it was situated across the street from a Target and next to a Red Robin, Joe's Crab Shack, Outback Steakhouse, Oggi's Pizza, Coco's Bakery and more. So, I knew that when we were not at the park we had restaurant options within walking distance. 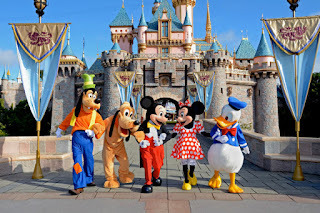 With our vacation package, we opted for the 5-day park hopper option for Disneyland. That seems like a lot of Disney, but going in July, with Friday being the actual 60th anniversary of Disneyland, there were a lot of people there! To be able to see everything and ride our favorites more than once, (sometimes 4 times) we needed those extra days. To save money, we drove (we live in Northern Utah) to California. My sister lives in Southern Utah, so we split up our drive and spent the night at her house both going to California and also on our way home. She's awesome and made us dinner and breakfast while we were there, so that helped us save on food. (I also paid her with Franz gluten free bread and Flying Cauldron Butterbeers, so we were probably even). In planning, we figured we could and would be spending ~$50 for each meal, and that was about right. I brought bread, peanut butter, honey, applesauce, etc. for times we didn't want to eat out and that worked out great. I also brought hamburger buns for when we were at restaurants that didn't offer gf buns and the kids wanted burgers, and muffins for days that the kids didn't want to eat the hotel breakfast. I also brought snacks, like fruit snacks, applesauce, and Kind Granola Bars into the park with us everyday. A backpack is a must at Disneyland. And you don't need to get a locker, they allow your backpack with you on pretty much all the rides, the ones you can't have them, they have bins you can place them in on the side. My backpack was packed with snacks, water bottles (which we refilled throughout the day, it was HOT! ), wet wipes (for cleaning hands when you're not next to a bathroom and for when you eat turkey legs! ), sunscreen, chap stick, essential oils, Excedrin, bandaids, moleskin, a foldable picnic blanket (for reserving spots at parades and for the beach), a comb (for when my hair got really crazy from the rides), an umbrella, and our autograph books for the boys. I also had a crossbody smartphone purse that I used to carry my smartphone (of course), money, and our tickets and fastpasses...it made it extremely quick and easy to pull these out as needed with this little purse. Also, we planned on letting the boys get a hat, a shirt, and a toy. We got a little soft there, and they ended up getting 2 toys, instead of one, and we got them a special 60th anniversary pin, since they both collect pins. Both my husband and I got 2 shirts and bless my hubby's heart, he got a pair of shorts...out of necessity. He ripped out the front of his shorts during the 3rd ride of our first day (I didn't think of carrying around an extra pair of shorts for him), so we forked out $50, so we wouldn't have to go back to the hotel to change. I'm telling you this, so you can plan for this type of expense. Shirts were $20+tax for the kids and ~$33+tax for adults, the hats were about $20-$25 each, toys were $11-$25 each (for the 4 toys we spent about $75), and the pins were $11 each. Plan to spend money on souvenirs and save for it, then it won't be a worry when you are there. Also, get apps on your phone. I had Disneyland Wait Times and Mouse Wait for checking wait times for rides, and in the case of Mouse Wait, food lines, as well. For food help, I had Gluten Free Disney Dining and Find me Gluten Free. Both of these were extremely helpful in guiding me to the restaurants we chose each day. Disney does take care of you, I promise, but some places are better equipped to take care of allergies than others. Also, utilize the Fastpasses. I cannot stress this enough. We had days full of rides, instead of lines. 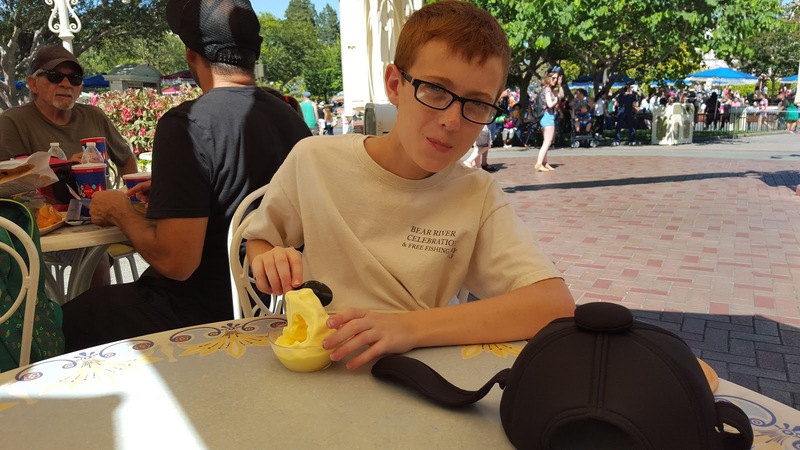 I read this post and this post from DLR Prepschool before going to Disneyland and laid out our plan for each day before we got there. A little obsessive compulsive, but my family thanked me, because we got to ride a lot of rides. If you are going to California Adventure, show up before the park opens. When they drop the rope and let you into the park, walk along the left side of Buena Vista Street and you will join the Fastpass line for the Radiator Springs Racers. It will seem like a long line, but you will be through it in 5 minutes. After that go straight to Toy Story Mania, that line gets long later in the day, but is fairly short first thing in the morning. At Disneyland, have one of your group grab your fastpasses for another ride, while the rest of the group gets in line for the Peter Pan ride...it gets crazy busy really fast and the craziness lasts all day long. Really DLR Prepschool has the great advice, so check out the above links and follow her advice. Stay tuned for my posts on what we ate while in Disneyland!